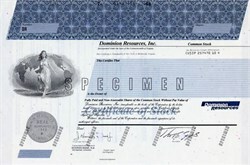 Beautiful specimen certificate from the Dominion Resources, Inc. Company. 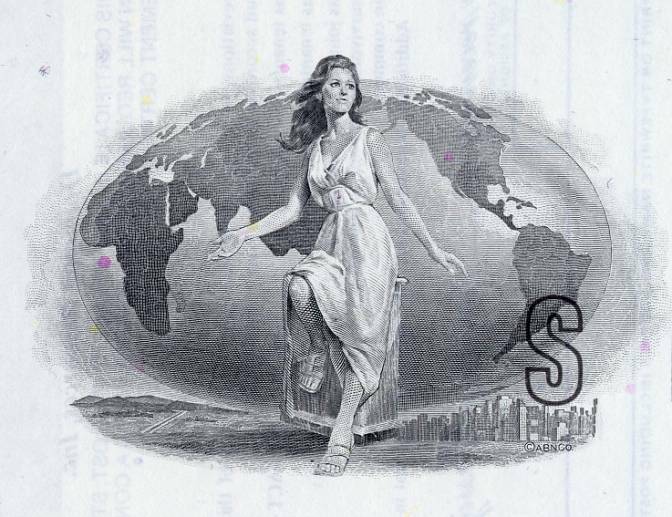 This historic document has an ornate border around it with a vignette of a woman in front of a globe. This item has the printed signatures of the Company’s President, and Secretary. Dominion, headquartered in Richmond, Va., is one of the nation's largest producers of energy. Dominion's portfolio consists of nearly 24,000 megawatts of electric power transmitted over 6,000 miles of transmission lines, 5.7 trillion cubic feet equivalent of natural gas reserves, 7,600 miles of natural gas pipeline and the nation's largest underground natural gas storage system with nearly 960 billion cubic feet of storage capacity. These certificates are normally stamped "Specimen" or they have small holes spelling the word specimen. Most of the time they don't have a serial number, or they have a serial number of 00000. This is an exciting sector of the hobby that has grown in popularity over the past several years.